As you probably know by now, FAU has chosen both the architects (HKS, previous projects here) and the construction firm (DPR construction) for the forthcoming Schmidt Family Complex for Academic and Athletic Excellence (hereafter referred to as The Schmidt), allowing the university to set a groundbreaking ceremony date of January 20th. Consider it a late Christmas/Hanukkah gift, though 12 days in advance of National Signing Day for NCAA athletes on Wednesday, February 1st. The Schmidt is being built for expansion (more on that in Phase 2 below) but I do hope that the weight room in particular is built with expansion in mind because it's considered a selling point of the program and it'd be nice to see us have 30k+ sq feet to compete with the big boys. on the upside, our weight room is supposed to have a saltwater fish tank… maybe that will sway 'em. 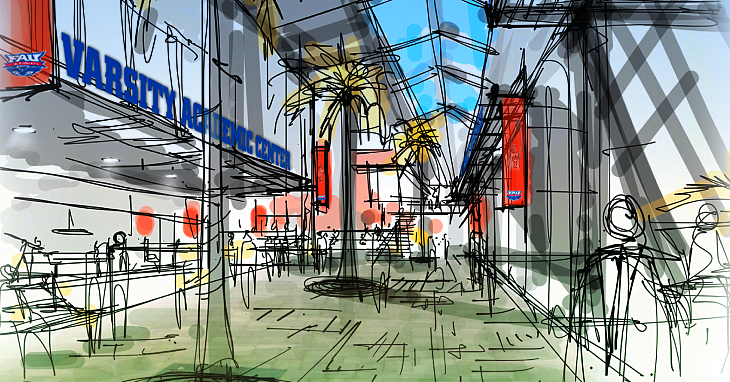 Read some interesting things about the design on the FAU facilities page DRAFT program. 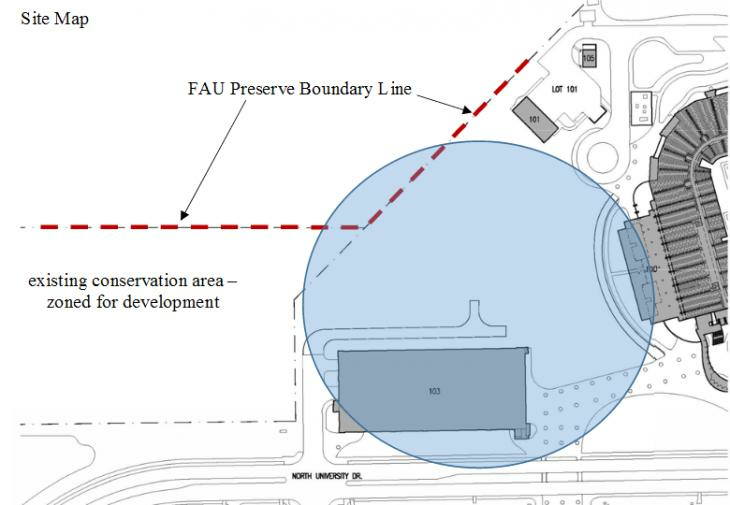 To be fair, FAU is being sensitive to the Preserve just west of PG3 and trying not to encroach into it too much but that's up to the architects. There's really no good option there because if you go west you go into the Preserve and if you go north you cut into the burrowing owl field. We'll see what happens. - A PLACE TO EAT: one of the criticisms of our program, both internally and recently externally from people writing about Kiffin's move here, is a lack of dedicated dining area for athletes. This facility solves that with a 2000 sq ft, 125-occupant banquet hall. There will also be a nutrition station. - HYDROTHERAPY: 1 hot, 1 cold, 2 extremity, 2 underwater treadmills - Google it. It's a thing. - Kiffin's office will have a balcony into the Indoor Practice Field. - ACADEMIC SPACE: "It is anticipated" that the 1st floor of Parking Garage 3 will be academic space for the MBA Sport program, Exercise Science & Health Promotion (ESHP) and other support. The ESHP component would include FAU Sports Performance Laboratory and the FAU Sports Biochemistry Laboratory, as well as 4 offices. The ESHP program is doing well and a January 2016 review found that they need an instructional exercise instructional lab 3x the size of their current space because of demand as well as a biomechanics research lab that plays into one of the university's stated research goals of Healthy Aging. There's also potential for the ESHP to collaborate with the colleges of nursing and medicine. - SHOWCASE FOR OUR HISTORY: Also included in the plan is a 2600 sq ft Sports Memorabilia Museum with space to accommodate social functions for 25-30 people. Apparently Kelly will soon present to the architects the details of conversations with "the owner of a large (in terms of items and monetary value) sports memorabilia collection" to house the collection in a museum-like area in the Schmidt. It would be a "destination spot" with MBA-Sport students potentially working as docents. Pretty excited about this. Hope it turns out well. 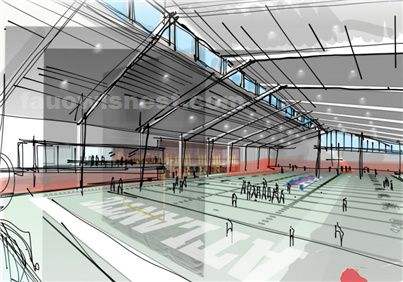 - PHASE 2 is the Indoor Practice Field, Sports Memorabilia Museum and Exercise Science components. Price and completion date TBD. - RENOVATING THE STADIUM: Spaces that may get renovated in the existing stadium include the recruiting room, home team locker room, cheer squad rooms, band room and video control rooms… about 15k sq ft. ...If that's not everything you wanted to know about the new complex, I don't know what else to tell you. Now we wait on groundbreaking, then renderings (hopefully that same day) and then the soft open, but again don't expect this thing for another year and a half (summer 2018). - FIU has the $15M, two-story, 50k sq ft Kirk Landon Football Fieldhouse that opened in 2009. The weight room is 14k sq ft.
- Middle Tennessee has a Sports Medicine facility and a 10k sq ft Sports Performance Facility that serves all student athletes. - Western Kentucky uses the west grandstand of Houchens Industries-L.T. Smith Stadium for football offices, 10k sq ft weight room, 8500 sq ft training room, etc. - Marshall has been a little more ambitious, opening the 102k sq ft Cline Athletic Complex (including an indoor practice field), 15k sq ft Buck Harless Student-Athlete Center and 22k sq-ft Sports Medicine Institute. 1) After Phase 2, what's next? Most FAU fans would split down the line about the baseball stadium vs a new basketball arena. Since The Burrow more recently got an expensive facelift, I guess the honor would go to baseball/softball. They're due. Wonder how swimming and diving feels about their facilities? No one ever seems to ask. 2) Since The Schmidt is going in the location earmarked for the new Convocation Center/Arena from the old Master Plan, where will that be located now? FAU is drafting a new Master Plan and that'll give us some answers. Again I'm going to throw out the idea that whomever builds the hotel in the southeast side of campus is expected to build a "conference center" anyway and maybe we can split the bill to get the basketball arena built there... can you imagine driving along Glades and seeing a basketball arena on your side? Would get more use out of that easternmost entrance to the campus too. 3) Could Lot 5, north of the stadium, be used for future facilities? I wouldn't be surprised if the practice fields went there on the north side of the stadium access road. Would cut into Lot 5 and the burrowing Owl territory but there would probably be your best shot for putting practice fields close to the stadium. If that happens, it would displace The Rat's Mouth again and would also complicate any potential Greek Housing plans for that area. Another thought would be parking garages. As the football fanbase grows, there may be a desire to build more parking garages there. 4) What happens to the Oxley once football moves out? You still have baseball, softball, soccer, volleyball, etc that can use the offices. I don't see anything in this budget for renovating the Oxley. And if football moves their practice fields to the stadium area, what happens to the old practice fields? 5) Although I completely understand the academic component taking over the first floor of the parking garage, I'm still puzzled why that space is even still available. The university was really gung-ho on the Innovation Village concept back in the day; I remember a UP staffer joining FAU representatives as they toured UCF's Knight Plaza and them quoting the trustee who said, "we're doing this!" Except we didn't. Facilities told me there wasn't vendor interest in developing the stalls. Again, strange, since FIU built new parking garages and filled them with vendors. I was really hopeful for this development and it slipped through, so I'm glad somebody is using the space. 6) I wonder what plaza improvements will be made here as part of this project. The original Innovation Village renderings showed a fountain. Then the plaza was built without a fountain. Then another rendering popped up for a fountain, then no word about it. Doubt the fountain will be part of this but I hope that's still on the radar. Would be a nice touch. Final thought: All in all this has been one of the most exciting developments for FAU in awhile. It's one of those things where you throw out the idea of a $40-50M athletic center like you'd see in a Power 5 conference and people would answer, "Yeah that'd be nice but it's not realistic for FAU." But this is why you dream. This is why you push forward, you ask your donors, you show off renderings... because you never know what ideas might take flight after all. And that's the same point of this blog. To dream and see what happens. FAU is going to grow. FAU is going to spend millions of dollars on new buildings and facilities. If we're ambitious, we can do great things. We can build a $70M stadium. We can land Lane Kiffin. We can attain an average 3.96 GPA. The future is bright here... and that's no longer just a saying. What another Great update. Cant wait for the ground breaking. Maybe we can raise some more funds when the shovels hit the actual dirt. I plan on attending. I have already asked for the day off.